Granted, the book starts off indicating it was going to be a love story in which the wife meets an early demise. But somewhere in the middle of the book, I forgot about that because I got wrapped up in the rest of the story. So, in the end, it was a startling and unexpected ending. Which, if I think about it, makes it a very good book. That being said, it is true that Sheldon credits his ability to enter into the Christian faith to Lewis and his writings. I can certainly understand why he would take the time to discuss his relationship and share his correspondence with such a great man. But it almost felt forced. The book really settles best with the reader when you think of it in terms of Sheldon & Davy. To include Lewis makes it feel awkward. It almost feels like he's name dropping in some respects and I'm not a really big fan of "name droppers" (i.e., those who must mention that they know So-and-So to make themselves sound more important). No, I'm not claiming that was Vanauken's intention. I'm just saying it had a feel which made that aspect of the book distasteful. The long and sort of the point I'm trying to make is: Don't expect this book to be a work of Lewis. Because it's not that. In that case, what was this book? Without trying to sound hard hearted (for I have reasons to sympathize) it was a work of grief, similar in nature to Lewis' A Grief Observed, written by Lewis following the death of his wife, Joy. Writing was the way that Vanauken was able to process his relationship, his feelings, his joys and his grief over his marriage and loss of his best friend, Davy. It is a desire of a husband to remind the world that such a lovely creature as Davy existed. It is a work to honor and respect and help him to deal with his past and his loss. I do think it is important to know that going in. It's touted on Amazon.com as a "heart-rending love story" and I suppose it is that. As I mentioned earlier though, I got sidetracked by other aspects of the story that made me forget this was about their love story. The part I found fascinating about this book was that he walked his readers through his and Davy's change from "paganism" (his terminology) to Christianity. He spent a great deal of time and attention focused on why he walked away from faith as a child and how they both returned to Christ while students at Oxford. I'm not even going to try to duplicate his reasons and explanations in this blog post for I cannot do it justice. It was interesting - and I'll leave it at that. Do I think this is a worthy read? I'm afraid of a lynching if I say "no." But I'm really, sorely tempted to say no. My gut feeling and opinion is - if you want a sad-ending love story to read - go ahead. It certainly won't hurt anyone or anything. However, if you really want to walk through someone's grief and think of it in a human AND spiritual way - Lewis' Grief Observed is superior. I have to think that even Vanauken would agree with me, seeing that we agree that Lewis was a brilliant man. Grant it, Vanauken walked the path before Lewis did and gave them more in common (in a manner that no one wishes to share commoraderie) than they did before. I just don't think that this book is what it advertises itself to be. Yes, a love story. A recollection of a coming to the faith. A corresponding relationship with Lewis. But the bottom line is: This was a man who missed his beloved wife. In that, I find no fault. I remember reading this book in college, where all the nice single Christians esteemed this as the way marriage should be. My own happy marriage is so completely different from the kind Sheldon and Davy had that now it seems a little too sentimental. And where on earth did they get all their money? That's never clear in the book, but it allows so many of their choices that would be impossible for the rest of us. 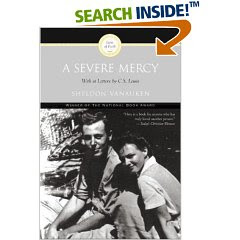 I have a copy of "A Severe Mercy," but haven't read it in years. Note to self: Read "A Grief Observed." My husband and I were each given a copy of this book by a friend when we got married. We read it together, and I found it to be a powerful and compelling story. I love this book - have read it several times for the beauty of the writing as well as the love story - as well as the Christian / Lewis connection.